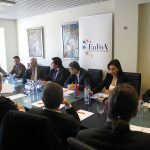 Today, on Thursday, 20 March 2014, European Friends of Armenia (EuFoA) organised a roundtable with Armenian Prime Minister Tigran Sargsyan, focusing on the prospects of EU-Armenia cooperation after the Vilnius Summit. EuFoA Director Eduardo Lorenzo Ochoa welcomed the guests and gave the floor to PM Sargsyan. His brief introduction was followed by an interactive and lively discussion of all participants. 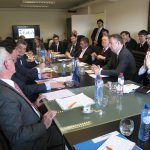 The event was attended by over 30 people, representing European Institutions, diplomats, think tanks and NGOs, including Members of European Parliament and representatives of the European External Action Service. “The need for a structured EU-Armenia dialogue has intensified since last summer, it is in this framework that EuFoA is launching a series of activities aiming at providing answers to the EU officials’ fundamental question: ‘What does Armenia expect from us?’, as well as to Armenians when they ask, ‘What can we do with the EU?’. 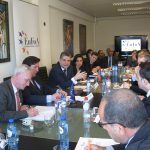 I am confident that with this series of initiatives, including today’s important roundtable, our NGO is bringing more clarity to this issue,” said Mr Lorenzo Ochoa. Armenia concluded its negotiations on the EU-Armenia Association Agreement, which includes a Deep and Comprehensive Free Trade Area in July 2013. However, its announcement to join the Russia-led Customs Union hindered its initialling, given incompatibilities with its trade component. Nevertheless, the European Union and Armenia have developed and reached a high degree of cooperation over the past four years. Proof of this includes achievements in many areas as the EU underlined in the 2013 progress report. The EU enjoys deep relations with other countries that belong to existing Customs Unions which extends even to the economic and trade fields, as it is the case with Uruguay or Brazil. Moreover, the European Parliament adopted a report last week calling for the ease of trade barriers with the Eastern Partnership countries, even prior to signing and implementing trade agreements. In addition, recently, the European Council President announced the possibility for Ukraine of signing first the political and later the trade part of their Association Agreement. 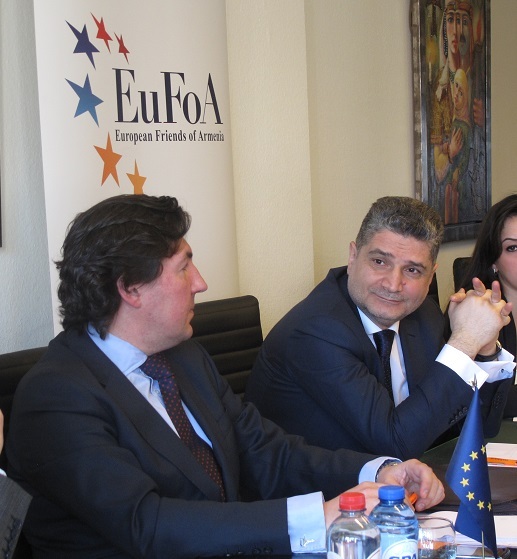 EuFoA is therefore committed to structuring a dialogue on EU-Armenia relations around all these elements, contributing in this way to a productive exchange of ideas ahead of a prompt establishment of an upgraded and mutually beneficial legal base for EU-Armenia relations, which would cover all possible areas of cooperation. In the past, our NGO planned a series of events along these lines, such as last year’s roundtable with the secretary of the Heritage faction in the Armenian Parliament, as well as the February 2014 event hosted by the Centre for European Studies (CES), where the recently published paper “Future of EU-Armenia relations” was presented by Mr Lorenzo Ochoa and discussed as a draft.